My name is Tiffany Chu and I’m a 3D games art student in my final year of studies at the Gnomon School of Visual Effects, Games + Animation in Hollywood, Los Angeles. 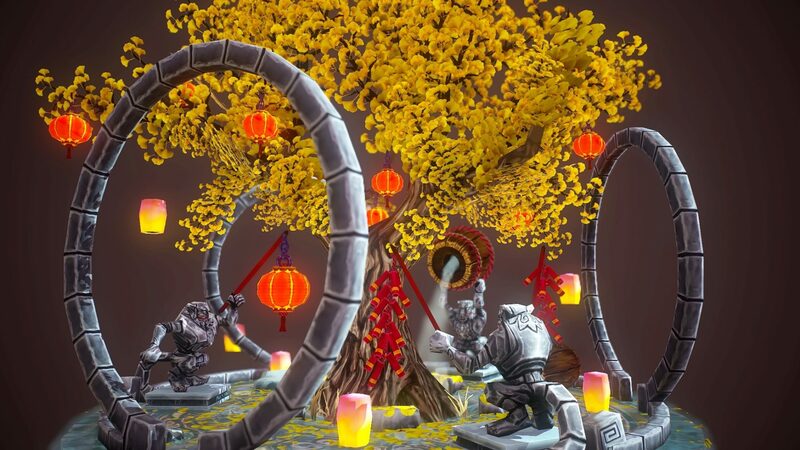 Glade of Lunar Festivities was my entry for the 2016 Blizzard Student Art Contest. It’s also my second time ever making a hand-painted environment! (You can check out my first attempt at a hand-painted prop here in my Sketchfab portfolio). The challenge was creating a full diorama from an original concept before the contest deadline. I only had two weeks during winter break to tackle this extracurricular project! Time was of the issue. I had to gather lots of good references and inspiration quickly and carefully plan out efficient UV layouts to save as much time as possible down the road in texturing. First I visited the famous Huntington Gardens here in LA and took lots of photo references. Nothing beats seeing nature in person! I was especially inspired by the beautiful gingko trees in the Japanese garden area and their carpet of golden leaves. After I went home, I quickly doodled a sketch of how I’d want the diorama to be laid out. I also painted a few gingko leaves which I could later use all over my model. The lunar new year was approaching in February and the story I wanted to tell was joyful and festive: lots of lights, red and gold tones for luck and prosperity, some spirits and liquor barrels and last but not least, Hozen shenanigans for the year of the monkey. For the Hozen statues I wanted three similar ‘see no evil, hear no evil, speak no evil’ models in slightly different poses. First I made an extremely basic sculpt in Zbrush to get the rough shape. I then brought it into Maya and retopo-ed it into the low-poly style that the contest required. To save time instead of rigging, I duplicated the first statue and separated the arms from the rest of the model so I could reposition them individually. * Essentially, this allowed me to reuse the same UVs on all three models by only remapping a small area around the shoulders that are unique shown above. Otherwise, I modeled the tree and other props entirely inside of Maya. The contest called for a diffuse/unlit art style so I decided to skip additional sculpting and bakes, and then using those as guides to painting over, because of time. I ended up painting all the textures for the bark from scratch as it was personally a faster workflow for me. All that was left was uploading my model on Sketchfab to share with family, friends and followers! Previously I’d go with sharing via Marmoset viewer but I’ve become a Sketchfab convert because of Sketchfab’s great embedding features. It makes it so much easier to share on places like facebook and tumblr with friends who may be not so familiar with 3D. Afterall what’s more eye-catching than scrolling to see a cool rotating model on your feed that all you need to do is click on? I’m also really looking forward to including animation in future projects which Sketchfab now supports. Pro tip: Sketchfab embed comes with an auto-rotate feature for instant turntable! Just check desired field in ‘show options’ of embedding under your model. Also, shout out to the great Sketchfab community. The comment system makes it easy to reply and get feedback on your models from other artists. Bart and the Sketchfab Community team work hard to promote Sketchfabbers on both the site and other CG publications. You guys rock. You can see Tiffany’s work here on Sketchfab, ArtStation and Tumblr.